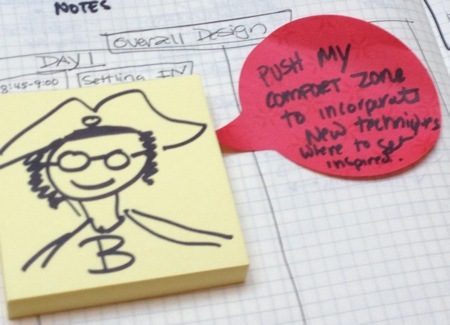 What is Human Centered Design? Is it only used by people with artistic talents and graphic design skills? Anyone can be a designer! These are methods for developing solutions (any type) in service of people. By applying this approach to program development or strategy, your nonprofit can get more impactful results. Six month agos, I was introduced to Luma Institute’s work as a participant in a Foundation convening to get ideas for their digital strategy development. I not only learned a huge amount, but I was able to systematically apply and iterate with the techniques over the last year. I was excited to take my learning much deeper with a two-day immersive workshop with participants who run innovation labs. 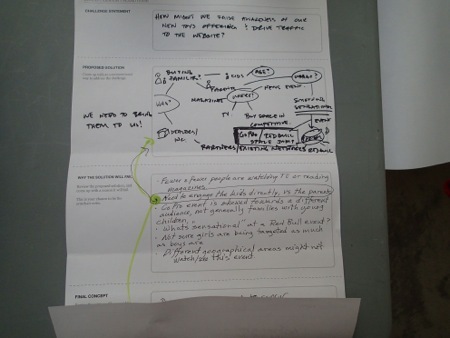 The sessions focused on how to combine various techniques together to achieve a specific goal and while there was a lot of “facilitating with sticky notes,” the overall process was larger than that. 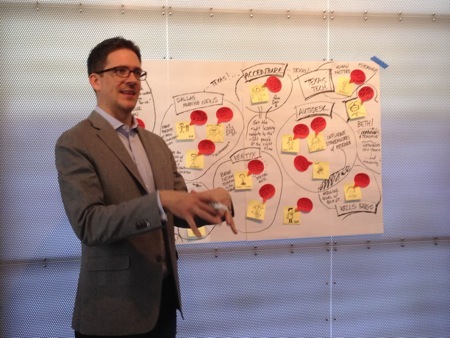 Here’s a some of what I learned about facilitating innovation and train the trainers design. The workshop had 16 participants, mostly people who run innovation and research labs from corporations. Since we were spending two days together, working on collaborative exercises, a good opening where we could introduce ourselves and make connections was important. We introduced ourselves by drawing a picture on a sticky note and using the speech bubble sticky to articulate a challenge in our practice. Next, each person got to introduce themselves and their challenge, while the instructor, Pete Maher, expertly facilitated a network map on the wall. Being able to do concept mapping on the wall with sticky notes is a core technique in a number of the methods that we practiced throughout the two days. It was great to watch as master like Pete do this and have him share some of his tricks of the trade that I was immediately able to put into practice the next day. When you are learning a new facilitation or teaching technique, it is important to not only listen to a lecture about it, but to practice it in the class with guidance from the instructor and then apply on your own. For each technique we were introduced to do, we were given a situation or simulation to apply it. The exercises we did were done individually (think and read/write), pairs (interviews), and in small groups. We debriefed in full groups. We learned and practiced a “making” technique called “paper prototype” where we created a model for an idea out of paper. 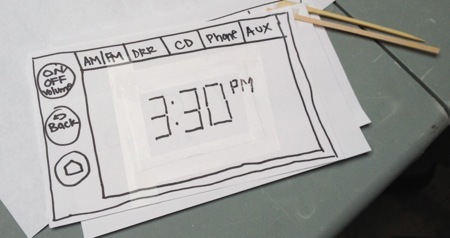 Each four-person team had 20 minutes to design and build a paper prototype for a new type of car radio. This lead into another technique we practiced called “Think Outloud User Testing,” where we conducted a user test of our paper prototype. 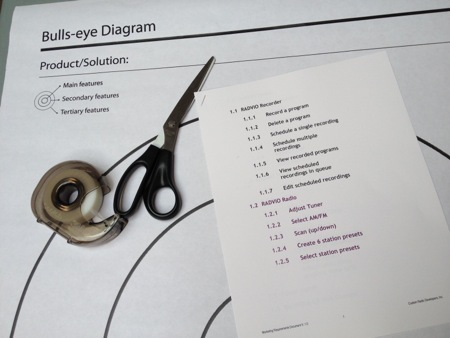 What was eye-opening for me is that while we were designing and building our paper prototype, all of us thought it was pretty clear how to use it. When we tested it, the tester had no idea how to turn on our radio!! It is humbling when you actually get feedback from the people you are designing something for. While I doubt that I will ever have to do design interfaces for a new car radio, the process was a stark reminder to me as an instructional designer to always get empathy from students in the course design process. This may be mean rapid prototyping as well as front-end research. I immediately came up with twenty ways to adapt this simulation and method for a nonprofit context! We learned many techniques, but the most important insight I gained was how to combine the different methods to support your goal. Innovation thinking is not just about creativity and generating ideas, it about combining, synthesis, and prioritization. One of my favorite techniques was called “Round Robin,” which reminded of the game played by Surrealists called “Exisquite Corpse.” We were given a piece of paper folder over so you could not see the next three questions and asked to write down the challenge statement. The next question we brainstormed solutions and passed the paper to someone else. The next question asked us to find flaws with the solution and pass the paper to someone else. In the last question, we were asked to add a final or revised solution. This reminds me of a similar technique I’ve used in face-to-face workshops over the years where you set up small groups to work at a flip chart and brainstorm ideas. Then each group rotates to the next station and adds their thoughts. Once everyone has a chance to see everyone else’s stations, the original team looks at and synthesizes the additional input. This was another exercise where we had to prioritize features on the car radio (which we later paper prototyped). We had a page with three circles and had to cut and tape the most important features in the center, second most important in the second circle, and the rest in the third. We worked in small teams. This exercise helped us think through a “Minimum Viable Product,” but more importantly get consensus on our team about what was most important. I could see this working well for prioritizing anything and particularly nonprofit web site requirements documents. It could also be applied to phasing a program or identifying a pilot for a strategy. For me, innovation is all about learning, creative thinking, iterating, doing, and practicing agility. That’s why I find it so exciting. How does your nonprofit facilitate innovating thinking and doing? Some wonderful tools and thanks for the pics as they help ‘get’ the tool. Love the priority circles tool. I used something like this over 20 years ago when I was working with aboriginal and non aboriginal community workers. I took everyone down to the beach and asked teams to walk and talk and find pebbles and sticks. 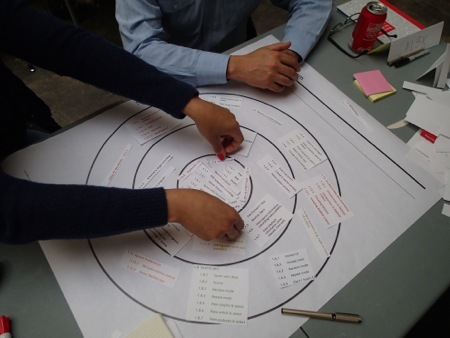 Each team drew the circles and then talked about who their stakeholders were – each one was represented by a pebble. The groups then placed pebbles in the circles according to a series of questions – how close was their relationship with a stakeholder? How close would they like it to be? Pebbles got moved in and out of circles depending on the question. Someone ‘mapped’ the movement of pebbles on paper as well as via camera. It was a lovely way to explore stakeholder connection and engagement. I was lucky enough to do this twice while i was at D&B, once with Pete. These tools are great as a UX Designer both in practice and evangelizing UX. The workshops were a great way to learn how to control your environment and a safe way to practice. Lucky you. I was also lucky to be a participant and then take the training. I learned so much and now have incorporated many of the Luma techniques into my practice. I just love the methods.